On Jan. 21, nine students and three adults from Casey County began this year’s 4-H Country Ham Project. The 4-H Country Ham project allows participants to have hands-on learning experience with the country ham curing process, an opportunity to develop/improve communication skills, and to obtain new information about various aspects of the livestock/agriculture industry. Country Hams are a throwback to the way food was preserved before mechanical refrigeration. 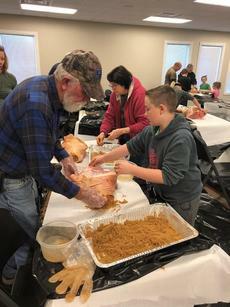 The 4-Hers and adults begin curing the hams in the cold months of January by applying a cure mixture of salt, brown sugar, and black and red pepper to the surface of the ham. Over the next several months, the cure mixture will penetrate the fresh hams and by March the hams will be fully cured. Country hams will develop their characteristic flavor and aroma during the warm summer months, sometimes referred to as the “Summer Sweat”. When completed, the 4-H Country Hams will be approximately nine to ten months old, weigh around 14 to 16 pounds, and will not require refrigeration. The process of curing country hams is a part of Kentucky’s food heritage and we hope to continue this tradition in Casey County. The hams are currently being cured in Adair County. Our hope is that these hams will be Casey County cured by 2020. We are in the process of organizing plans and funding to build our very own ham house. If you have interest in the country ham tradition and would like to participate or assist with the construction of our ham house, please contact Meagan Klee at the Casey County Extension Office at 606-787-7384.